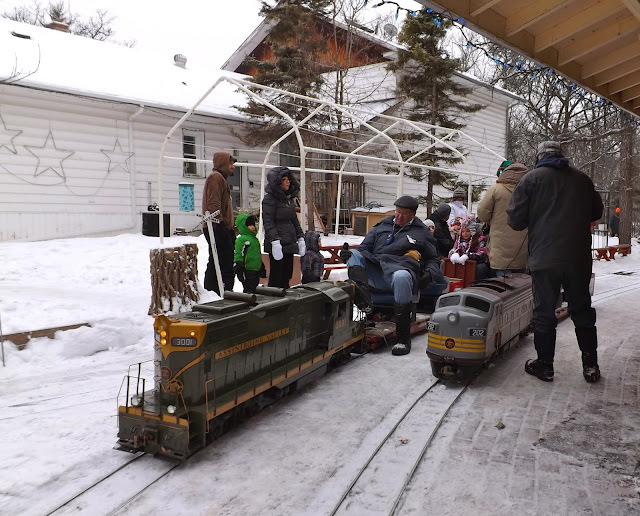 Winnipeg Model Railroad Club: Your last chance to ride the Assiniboine Valley Railway until spring! Your last chance to ride the Assiniboine Valley Railway until spring! Heads up, all AVR fans! The Assiniboine Valley Railway is open to the public on December 31 and January 1, and it's your last chance to ride the rails until the spring! What better way is there to celebrate the New Year than going for a wonderful winter ride on their trains? Their hours are from 1:00PM to 4:00PM. One ride costs only two bucks, and you can get a 12 ride pass for only $20, which is also good for any AVR Public Event! Kids two and under ride for free! All minors must be accompanied by an adult. The AVR is located at 3001 Roblin Boulevard, just west of Assiniboine Park.